Did you see the mirror hour 08:08 and want to find out what it means? Here we will give you a complete overview of this double hour’s significance. Your subconscious took note of this synchronicity and ever since then you have been under the impression that 08:08 was an important sign for you, even if you haven’t understood its meaning completely. Here we are going show you the meaning of the mirror hour 08:08 using several different methods. One of these methods is an interpretation through the 72 guardian angels. You will then have an understanding of the message that the angels were sending to you via this “twin hour”. You will also discover the meaning of the hour through numerology. The numbers hide a secret meaning, and all will be revealed! Be aware! What we are providing here are interpretations using various different divinatory tools. It is up to you to take enough time to analyze the feelings inside of you for those which seem the most relevant. Consider this interpretation a tool which will help you to analyze the mirror hours for yourself. Here, the angels are talking of liberation. If you feel that you are currently in a difficult period, or if things seem too complicated for you right now, then you are finally going to be freed from this burden, especially in the material aspect of your existence. You are someone who is aware of their responsibilities, but are you really giving them your all? The angelic interpretation of the mirror hour 08:08 suggests that you should check that you are doing all that you can. You have the potential to reach lofty ambitions and to move mountains, but to do so you will need to use all the assets at your disposal. You certainly have the opportunities, although you occasionally lack the perseverance. 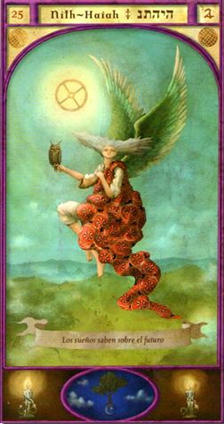 Here you have received an invitation from the guardian angels, an invitation to enlighten yourself through meditation. This practice will help you to reach what is known as a state of total awareness. This will allow you to get rid of your stress and anxiety. By focusing in on the present moment you liberate yourself of your fears and reach tranquility. The guardian angel corresponding with 08:08 is Nith-Haiah whose period of influence extends from 08:00 to 08:20. He symbolizes restraint and benevolence. He is the angel that trains people's wisdom and intuition. He allows you to gain greater understanding in the realms of spirituality and the divinatory arts. You can invoke him to help chase away evil, or fight off a curse. He will aid you in your study of the guardian angels and of Kabbalah. By working with the energies he gives you, you will forge yourself a powerful suit of spiritual armor. This will allow you to become a bearer of light who spreads your characteristic wisdom to those around you. He will also help you to master the interpretation of dreams. What does 08:08 mean in Numerology? The total value of the mirror hour 08:08 is 16, a number with great value in the spiritual world. You are able to see into yourself and others. Your intuition and your predisposition towards mediumship will allow you to progress in the esoteric world. You have the potential to help a great number of people if you work in areas such as meditation and hypnosis, as well as reflexology and well-being. Your development has made you an independent person, perhaps a bit too much so. This can lead to misunderstandings with the people around you, especially on the part of your family. You are sometimes difficult to follow! Remember that not everybody goes as fast as you do. You should put yourself in the shoes of the person you are talking to, or else risk losing them along the way. But be careful! 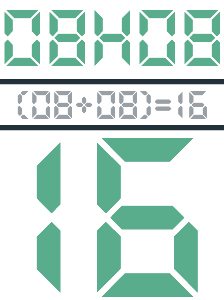 The mirror hour 08:08 is also sending you a warning through the number 16. If you do not take the path of humility and end up with an oversized ego, you risk falling from the pedestal that you’ve built for yourself! 08:08 can suggest a disappointment or even a resounding failure if you don’t maintain a caring attitude. It can be exhilarating to have superior abilities or an advantage over others, but you must realize that if you cross certain lines in your behavior you will have to face the consequences, consequences which risk following you around for a long time afterwards! If you have already crossed these lines, and are currently feeling exiled, you should take this time to check in with yourself! This will allow you to sense the positive attitudes you can adopt in order to improve the situation. The Tarot card corresponding to 08:08 is Justice! This Arcanum symbolizes respect for the law. She embodies justice in decision-making. She represents organization and judgment. She is the authority over everything! 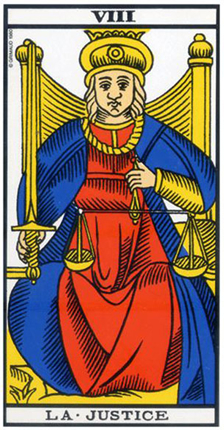 The Justice card is often dominant in a reading. She exerts her decisions over the other Arcana. She is a sign that something important will happen, regardless of in what area. She will bring balance and honesty. She supports people who work in an administrative role. You cannot mention justice without also mentioning judgment! If you are currently concerned by a court case, 08:08 is an unwelcome suggestion that you will face condemnation. But this could also be true of your romantic or professional life. You are going to have to be careful about what you say and do! In love, Justice can have a dual significance: a marriage or a divorce, depending upon the cards which surround it. In either case there will be important decisions to be made concerning your emotional life. At work you risk having to deal with lawyers or judges. This could concern the signing of a contract, or the ruling of a court case. In terms of money, this card suggests that matters concerning a will or an inheritance are going poorly. 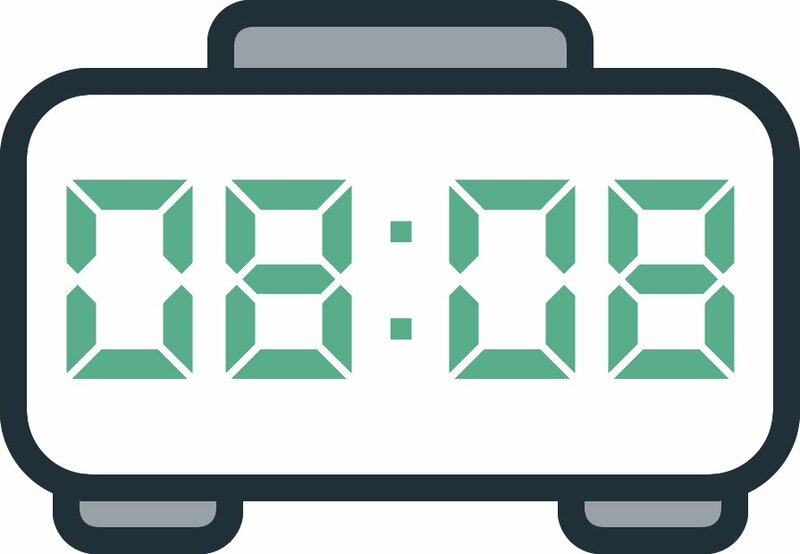 Any comment on the 08:08 mirror hour? I have been struggleing with medical issue that had locked me up for a month…..never been so traumatised. I also see 08:08 regularly.